We all remember when Alice fell down that rabbit hole and ended up in Wonderland, but through it all she was so naive and innocent about everything. Like she just trusted the Cheshire Cat for literally no reason. Had she even met a cat before that? Cats are so conniving and manipulative! And the weirdest thing is that Alice had a pet cat, Dinah, so how did she not know to be suspicious of the Cheshire Cat? Maybe she was just too busy running after that white rabbit all around the town. Whatever it is, all we know is that eventually she finds herself in front of the queen about to lose her head. Fortunately, Alice escapes. I haven't wore this costume yet, but did try it on upon receiving it. I ordered a medium and probably should have ordered a small. I'm right on the verge. (120-125 lbs) The costume is much longer than I thought it would be. I am 5'4". With that being said, I did purchase a thigh length petticoat for volume and in case it was a short dress. No need to be worried about it being too short! And the white petticoat that I received has a yellow stain on it. So, if you do go with a petticoat, you might need a longer one. I also purchased the Mary Jane shoes in the photo. They are almost too small. I'm not sure if they come in half sizes or not, but if they do, go up. I'm an 8. 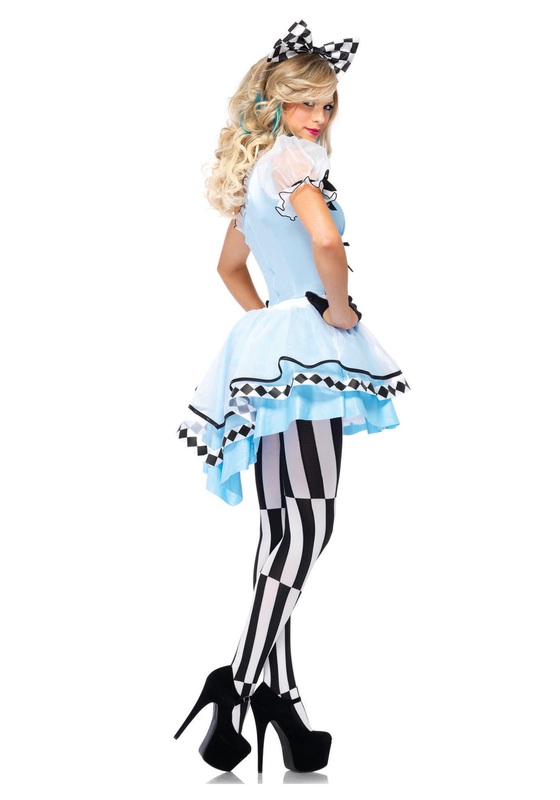 I also purchased the optical illusion tights and the cropped gloves. Overall, I like it.